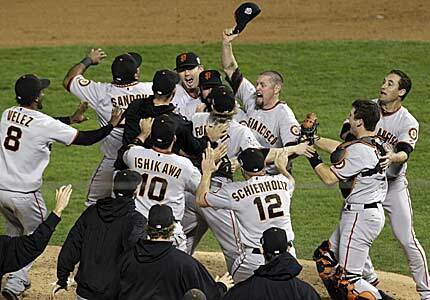 You missed Tim Lincecum going 8 innings and throwing 10 strikeouts in a World Series clinching game. You missed 14-year veteran journeyman Edgar Renteria driving in 3 runs in that same clincher, earning him World Series MVP. You missed centerfielder Cody Ross slamming 5-postseason homeruns, including two against Phillies ace Roy Halladay in the game that sent San Francisco to The Classic. Giants unsung starter Matt Cain going 7 innings in his LCS start allowing no runs and just two hits, then following up that performance with a World Series start in which he went 7.2, giving up no runs and just four hits. You missed closer Brian Wilson striking out 16 over 11.2 postseason innings while posting saves in the clinching games in the DS, LCS, and World Series. Finally, you missed the 2010 World Series Champion win every series on the road, in Atlanta, Philadelphia, and ending it in Arlington. Yes, while you were too busy for a non-Yankee, Phillie, Red Sox, or Cardinals World Series, the now reigning champion Giants put on a performance for the postseason books. Winning 7 of their final 10 games, the Giants were able to hold off San Diego and pull down the National League West. Behind starter Jonathan Sanchez, the Giants September playoff push became a reality. 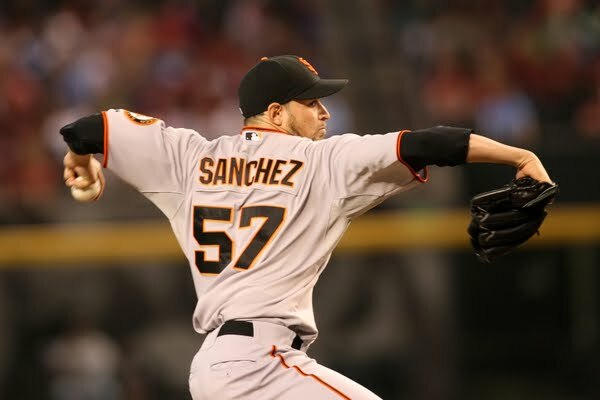 Sanchez took the mound six times down the stretch, and the Giants were 5-1 over those games. With a 1.17 ERA, Sanchez allowed just four runs over six starts. Even more important to the Giants playoff road, Sanchez won two games against division rival San Diego. His most impressive start came at the expense of the Dodgers. Sanchez struck out 12 over seven innings, allowing just one run. His September performance took the Giants into the postseason, while pulling together a rotation set to take on the National League best. Then came Cody Ross, the Giants standout center fielder acquired mid-season. Ross drove in the only and winning run in the Giants postseason opener against Atlanta. With Tim Lincecum going nine innings and shutting down Atlanta hitting, someone was going to have to step up and give the Giants the win, that was Cody Ross. Then in the NLDS clinching win in Atlanta, Ross followed up his game 1 RBI with a homer and a game-winning RBI single. Ball game. Cody Ross would smash two homeruns in the NLCS and another in the Classic, carrying a Giant offense that wasn't used to putting big runs on the board, players like Cody Ross put enough on the board in order to turn it over to the Giant staff. Every season there's one closer who turns the postseason into turn the lights out, game over! Foulke, Jenks, Wainwright, Papelbon, Lidge, Rivera, and welcome to the club, Brian Wilson. Fear the beard! The Giants peculiar closer, Brian Wilson had a postseason for the books. He struck out 16 batters in just 11 innings. He had two saves against Atlanta, he had three saves against Philadelphia, and it was only fitting Brian Wilson was on the mound as the Giants clinched the World Series, striking out his final batter. He walked only four batters, allowed just 1 earned run on five hits. 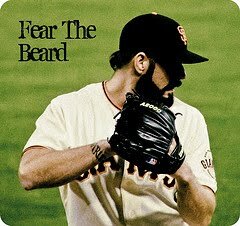 Brian Wilson transformed the Giants into a bunch of starters who can take you deep into games, into a staff that showcases THE turn down the lights closer! Get after Brian Wilson, because he's the toughest pitcher to take the mound this side of Rick "Wild Thing" Vaughn! Raise your hand Tim Lincecum. Of all the postseason stars from Roy Halladay to Cliff Lee, Tim Lincecum defeated each one of them. The Giants 26-year old 2x Cy Young award winning righty took to the big stage with ease. Lincecum opened the postseason with a 9-inning, 14 k's, two-hit gem. He baffled the Braves lineup, yet was still overshadowed by the no-no from Halladay in Philadelphia. 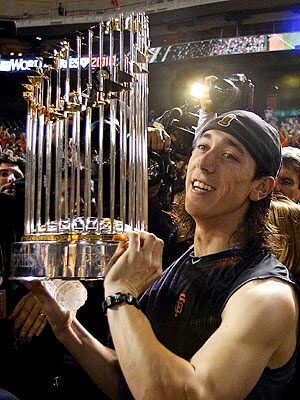 Yet by the time all was said and done, it was Lincecum standing tall. Closing the postseason on an 8-inning, one run, 10-strikeout performance against the American League champion Rangers. Lincecum looking to grab his third straight Cy Young has answered all questions, there isn't a pitcher better. What you missed was one of the greatest postseason performances we've seen from a collective team. The Giants were a team of pieced together players from Cody Ross and Edgar Renteria to rookie Buster Posey and other home grown talent like Lincecum and Cain. Keep talking about writing a baseball death sentence with the Rangers and Giants being in The Classic, and I'll keep watching fascinating baseball. Get After It! Audio Lynchy!